Located just south of Ventura, in the Channel Islands Harbor of Oxnard, Bahia Yacht Marina is a perfect mooring location for those seeking a leisurely cruise around the harbor, to explore the Santa Barbara Channel, The Channel Islands National Marine Sanctuary, and the Catalina Island Channel. Bahia Yacht Marina offers a resort like atmosphere with access to a clubhouse, tennis court, swimming pool and whirlpool. The Marina is a short walk to Harbor Landing, the Marine Emporium Landing and Fisherman’s Wharf, allowing you to enjoy activities within the surrounding harbor community. Channel Islands Harbor is the fifth largest harbor in California for small-craft recreational vessels. 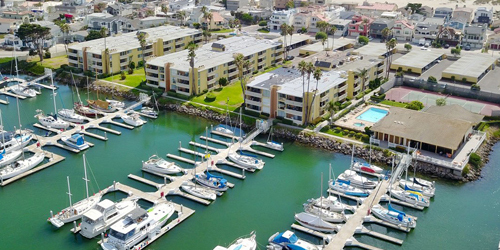 Bahia Marina is close to several shopping complexes which includes a Vons Grocery Market, Yolanda’s, Pizza Man Dan’s, and other great dining and shopping locations, allowing you to enjoy activities within the surrounding harbor community. You can take a walk around the harbor, visit one of the local parks or beaches, rent a kayak or a boat to cruise the beautiful Channel Islands!